Colleen O'Donnell of Waterville, pictured during the Purple Panthers' June 11 Eastern Maine Class B championship victory, was her team's only winner during Saturday's 4-1 state title loss to Greely of Cumberland Center. PORTLAND, Maine — Anna Collins’ experience at Saturday evening’s Class B tennis state championship meet mirrored those of most of her Greely High School teammates. A sport often known more for the shot-making skills required had evolved into a survival of the fittest, with four of the Rangers’ five matches against Waterville extended to a third set or tiebreaker, leaving the outcome in doubt for nearly three hours at The Racket and Fitness Center. But like her compatriots from the Cumberland school, Collins persevered — rallying from match point down in the final set to score the clinching point as Greely earned a 4-1 victory and its first state title in the sport. “Down 3-5 and two or three match points, for a while I thought it was over but you just hang in and see what happens,” said Collins after her 4-6, 6-2, 7-6 (9-7) outlasting of Waterville second singles player Emily Dufour that gave the Rangers an insurmountable 3-1 lead. While Greely joined the state championship scene for the first time, the Cape Elizabeth boys cruised to their second straight crown with a 5-0 victory over Camden Hills of Rockport. Greely (15-1) won despite the absence of its top singles player throughout the regular season, Alison Eaton, who left for Europe on a previously scheduled family trip before the Western Maine championships. But Greely’s depth compensated sufficiently against a Waterville team making its fourth straight appearance in the state match. 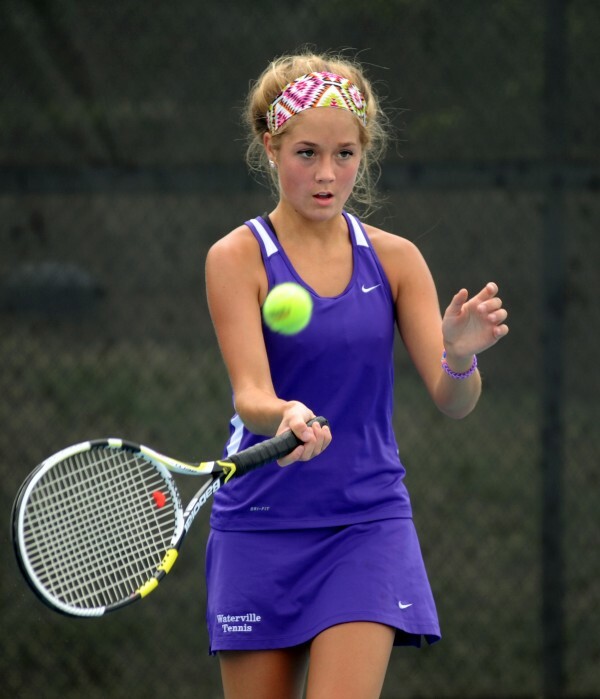 Top seed Colleen O’Donnell staked the previously undefeated Purple Panthers (15-1) to a 1-0 lead with a 6-1, 6-1 victory over freshman Katherine Pare, who moved up to first singles in Eaton’s absence. But while that match ended quickly, the remaining encounters were sheer endurance tests — with Greely each in three sets despite losing the first set in three of the battles. Greely’s second doubles tandem of Sarah Gooch and Sam Kennedy were the first to finish more than two hours after they started, outlasting Chelsea Cayer and Fotini Shanos 5-7, 6-3, 6-4. Olivia Tebbs then gave the Rangers the lead with a 3-6, 6-3, 6-3 victory over Olivia Benissan at third singles before Collins rallied and Dufour played their epic back-and-forth duel. The first doubles battle between Mia Lambert and Jessie Hoffman of Greely and Jayme Saulter and Emma Cristan of Waterville required nearly three hours just to split just two tiebreakers, and with the team result decided they played a match tiebreaker to determine the winner, with Greely winning 10-5. The boys match had considerably less drama, as coach Andy Strout’s Cape Elizabeth club used dominant singles play to defeat a Camden Hills team it had edged 3-2 during a preseason scrimmage. Cape Elizabeth — which graduated its top five players from last year’s title team — dropped just three games while sweeping the singles matches and added a pair of hard-fought doubles victories over a seniorless Camden Hills team (13-3) that started three freshmen, a sophomore and three juniors. Brazilian exchange student Gabriel Torres topped Austin Pohlman 6-1, 6-1 at first singles, Eli Breed defeated Matt Morse 6-0, 6-1 at second singles and Luke Gilman handled Josiah Krul at third singles without losing a game. Cape’s first doubles team of Ethan Murphy and Jack Hall outlasted Josiah Simko and Alex Forcillo 6-4, 5-7, 7-5 while the Capers’ second doubles tandem of Jack Tierney and Conner Sullivan rallied from a 5-4 first-set deficit to shade James Annis and Colby Arau 7-5, 7-5 at second doubles.